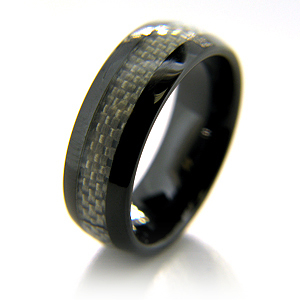 Black ceramic 8mm ring has a gray carbon fiber inlay. Domed ring with rounded edges. High polished mirror finish. Comfort fit. Made in USA. Our customers may exchange this ring as many times as needed for the lifetime of the ring for a different size. Return shipping fees apply.